When it comes to things to research when making your NFL spread picks, some things are obvious. Each team’s win-loss record. Their offensive and defensive ratings. Recent meetings between the two teams. Injuries to star players. Home and road performance. How each team looked in their last game. Almost all of us consider these things when we’re making our NFL picks against the spread. But there’s so many other things to look at as well. Each team’s recent and upcoming schedule should be a huge consideration when you make your NFL spread picks. So much about football is game-planning for your specific opponent, so the more time you have, the better. Players are also a bit more rested. Going into the 2013 NFL season, teams coming off a bye had covered the NFL lines 54% of the time since 2001. However, that spread-covering trend has slowed in recent years as oddsmakers have made adjustments. According to BetLabsSports, teams coming off their bye week were just 108-110 against the spread from 2009-15, covering 49.5% of the time. So it’s no longer a no-brainer to blindly bet on teams coming off their bye. It is, however, a pretty good idea to back certain teams (and coaches) when they’re coming off the bye week – if they’re good. BetLabsSports notes that since 2003, teams that were favoured in their first game after a bye week have covered the spread at a 58.1% clip. Even better, teams favoured on the road by 3 points or more have covered a whopping 74.5% of the time (38 of 51 games). In order to be favoured on the road in the NFL by a field goal or more, you have to be pretty good. So we can generally conclude that good teams coming off their bye week are solid bets against the spread in their next game. As Super Bowl-winning coach Brian Billick wrote for NFL.com in 2013, NFL players are creatures of habit. Whenever they’re taken out of their routine by a Thursday night game, it can have a negative effect on their performance. Bumps and bruises might not have healed as well from the previous game, and having a few extra days off before their next game could also throw off their rhythm. The same is true when they’re coming off a Monday Night Football game the previous week. Having one less day to watch game film and prepare for the upcoming opponent can be a pretty big disadvantage the following Sunday. Football’s an emotional, intense game. So if you’re not completely focused on your opponent, your play is going to suffer. Letdowns are possible any time a team faces an opponent that is way below it in the standings. Where letdowns become much more likely is when a team has an emotional win or loss, then faces a weak opponent the following week — especially on the road. Letdowns can also happen when a team is looking ahead to a game the following week and doesn’t properly focus on this week’s opponent. For years, a great strategy for making winning NFL spread picks has been to bet against west coast teams playing an early afternoon game on the east coast. 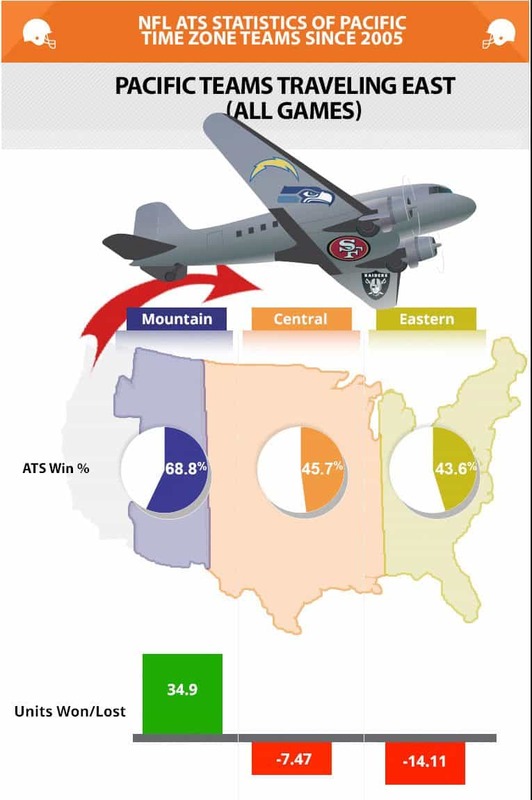 A Sports Insights article referenced this in 2013, pointing out teams from the Pacific time zone were 44-57 (43.6%) against NFL lines since 2005 when playing on the east coast. The article also noted that west coast teams were 16-38 (29.6%) against NFL lines when playing on the east coast after covering the spread in their previous game. Often, trends like this aren’t useful because they don’t make sense. This one, however, does. How useful would you be at work if you’re used to going in for 9 a.m., then had to come in at 6 a.m. one day? A good offensive line is a key to success, and teams will have options in free agency. A common mistake people make when doing their NFL spread picks is picking against a team just because its star player is injured. 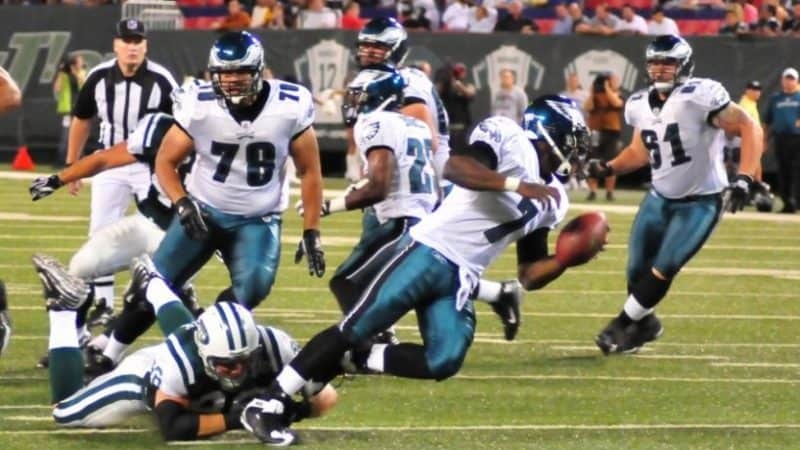 Oddsmakers know the star player is injured too, and they factor the injury into the NFL lines. You aren’t outsmarting anybody with this strategy. But when a no-name player gets injured, the NFL lines often aren’t affected. Offensive linemen are fat. They’re slow. You don’t usually notice them unless they screw up. But they’re important. When a team’s offensive line is banged up — especially the centre, who the QB communicates with on every snap — they can’t protect the QB or run the ball as effectively. In other words, it’s a good time to go against their team when making your NFL spread picks.